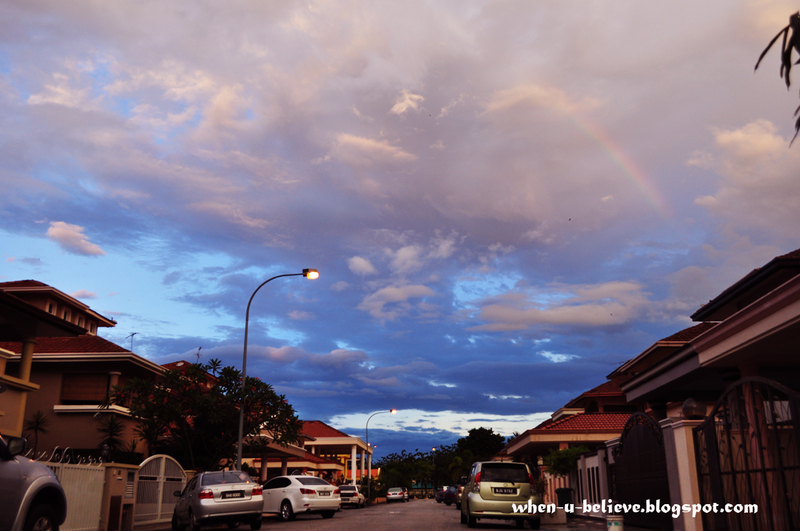 When You Believe: Rainbow Spotted! Nice photo. When do rainbows make people feel good? Beautiful skies. I share your enchantment when seeing a rainbow splattered sky thank you for sharing both your photo and your very tangible excitement.\happiness is contagious! What a beautiful sky!!! Love the neighbourhood, and with such a sky? Perfect! Wondrous sky and it really is beautiful. BTW, i also love your dimsum posts from below. This is a beautifully framed shot and a great capture. What a beautiful colors of the sky with a beautiful words. with a rainbow as an angpau! It wonderful! Lovely clouds and rainbow. what a beautiful sky! Great stuff! That's an incredibly beautiful sky. Thanks! ironic foto, calm and blue atop, busy and loaded below! love it! do enjoy your week and thanks for the visit. · Thanks, Kristin, for your visit and your kind comment. Sorry if my English is not very good. Beautiful sunset. I hope you find the pot at the end of the rainbow.